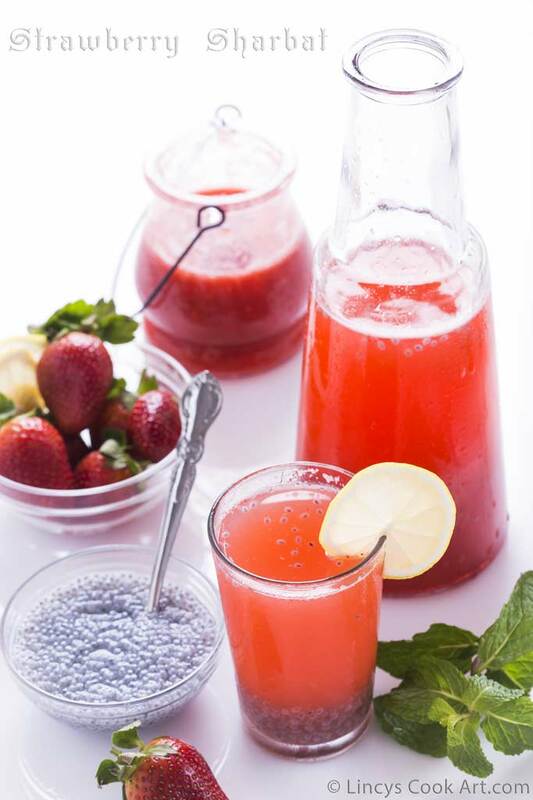 Strawberry Sharbet| Strawberry Sharbath| Strawberry Sarbath is nothing but a variation to lemonade. You could prepare this sharbet without lemon too. But lemon adds more taste and kick to this drink. I just tried this recipe like other sharbath with strawberries by making a home made strawberry syrup out of it and made this drink. It came out really well and tastes awesome. For more texture i have added sabja(basil) seeds too. If you have the syrup at home this drink could be made in a jiffy. I am happy with the out come so do try this recipe at home at this strawberry season! Soak the sabja| basil seeds in water just before preparing the drink. In a tall glass add the ice cubes strawberry syrup and lemon juice and sabja seeds. Add water just below the rim. Mix gently with a spoon to combine. You could make double the ingredients and make it in a big bowl for more people.